About Bryn Myrddin and the surrounding countryside. Bryn Myrddin is our holiday cottage, next door to our house which is called Waun-Yr-Ewig. Bryn Myrddin is an architect designed split level property, with three bedrooms, two doubles and a twin, and spacious accommodation, including a large central living room with vaulted beamed ceiling. There is a sun room with french doors, bathroom with shower and bath, and a fitted kitchen. There is a utility room with an automatic washing machine, tumble dryer and an additional toilet. There is a 42″ plasma TV in the living room, with all terrestrial Freeview channels and a Now TV box with the Sky Entertainment Pack and all catch up services such as BBC iPlayer, ITV Hub, All 4 and Demand 5. In the main living room there is a new multi-fuel stove for cosy nights in during the cooler months. The main heating is by night storage heaters. 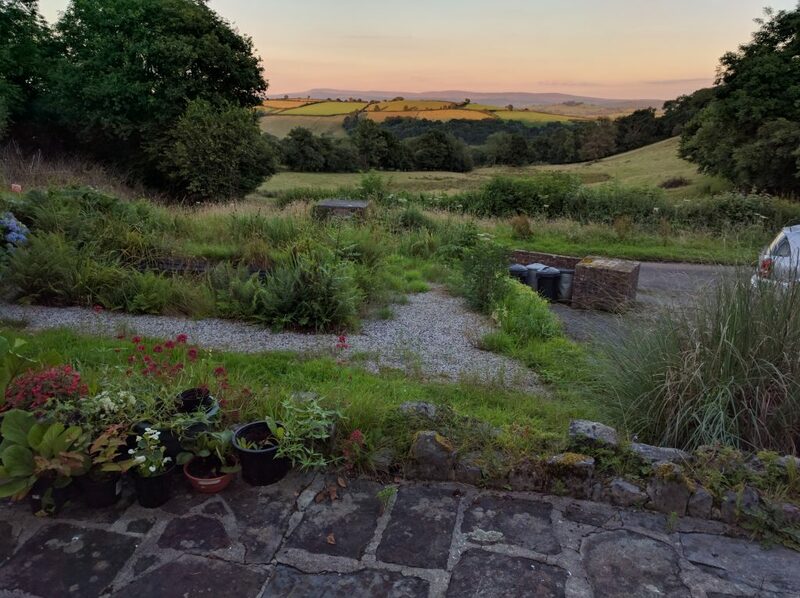 The cottage is located on the side of the Cothi valley, about two miles from the village of Pontargothi, where there are a couple of good pubs, the Salutation and the Creselly Arms, which both do good quality meals at reasonable prices. The Salutation is is Felinfoel brewery house and have the famous Double Dragon ale on draft. The Felinfoel brewery it situated in the village of Felinfoel on the outskirts of Llanelli. A mile on from Pontargothi is the village of Nantgaredig, from where you can take the B4310 to visit the National Botanic Garden of Wales, or continue for a few minutes on the A40 to Carmarthen town where you will find all the usual amenities of a large market town, including all the major supermarkets and other chain stores. The nearest shops to Bryn Myrddin are the community store and post office at Dryslwyn on the A40, just a few miles away towards Llandeilo, and there is an Esso garage and Spar convenience store in the other direction between Nantgaredig and Carmarthen at White Mill (Felin Wen in Welsh! ).